Victim, is that Grizzly locked down somewhere I can go get a screen shot of it? 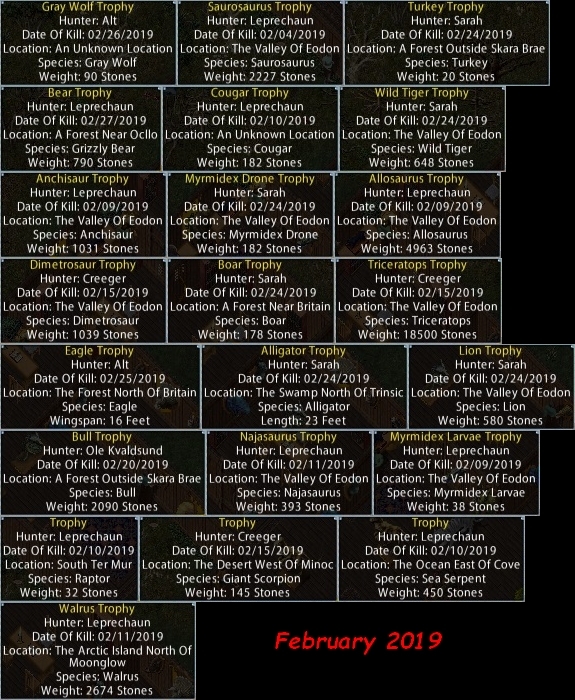 In the case of a tied weight, I'll record the oldest known kill to the record list. This month, Sarah bagged a 30 foot Alligator! Iâ€™ll lock it down this afternoon and tell you where it is. locked it down on the steps of my Safehaven Keep, which is right in front of Freja's castle. Thank you. 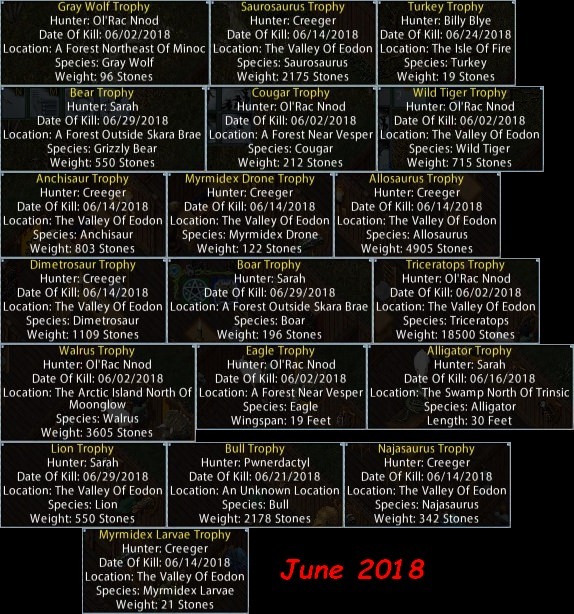 I got the shot, and I've updated the record. I have a new Triceratops record to report this month! Way to go me! 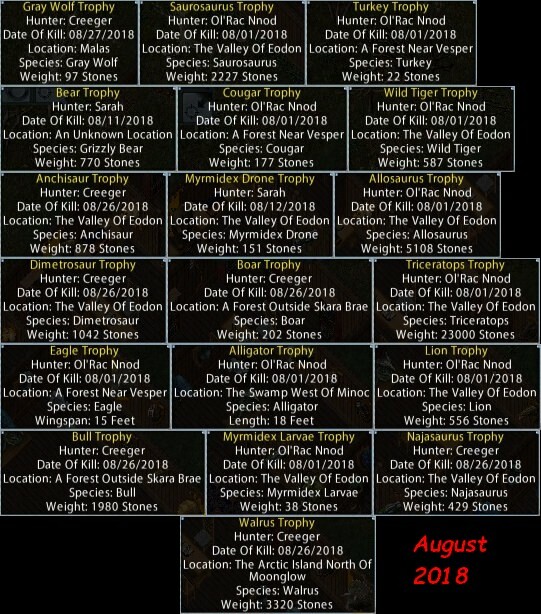 No new records were set in the month of August. However, Ol'Rac Nnod came very close with a 2227 stone Saurosaurus, which tied the know record. 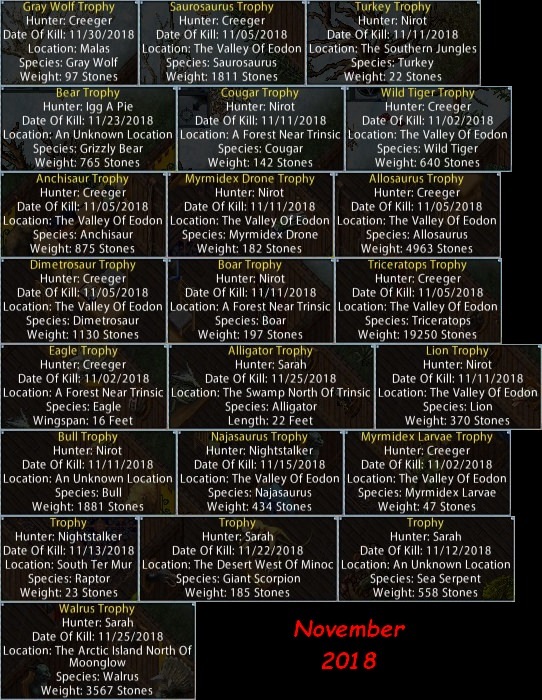 As you can see, Ol'Rac must have been hunting hard this last month! 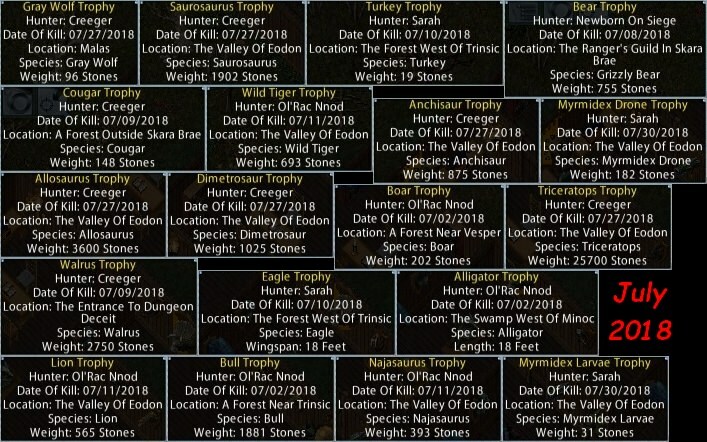 His efforts paid off with a record kill of a 2435 stone Saurosaurus. Well done. I don't understand your question, Levi. 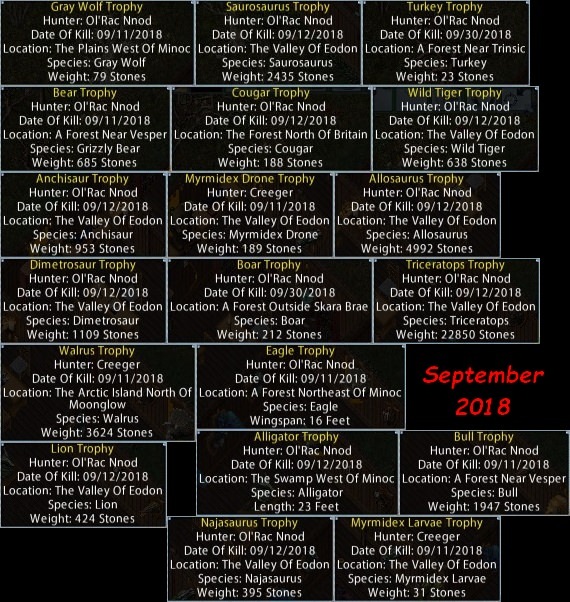 What a month it has been for the Huntmasters! 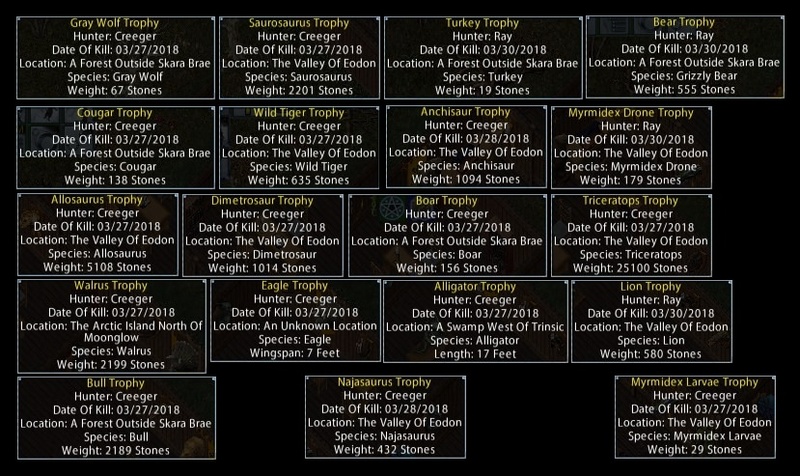 We saw three new species added to the challenge, and SEVEN new records set! 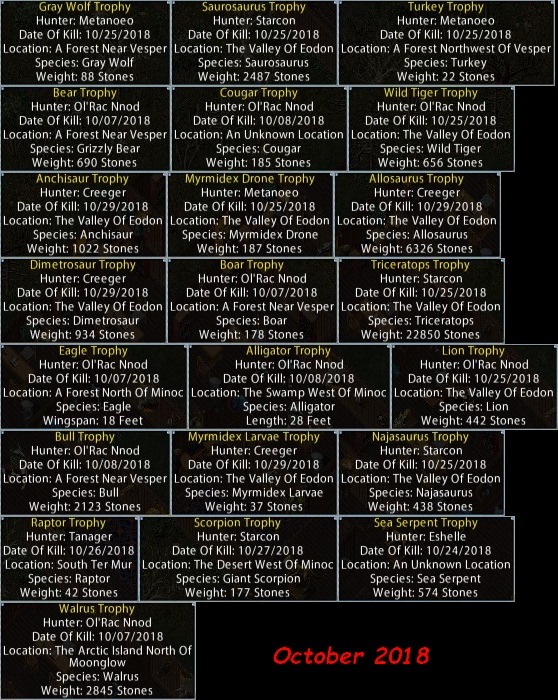 Well done, hunters, well done. This month, Sarah was the first to break the new Giant Scorpion record. She set a new record weight of 185 stones. 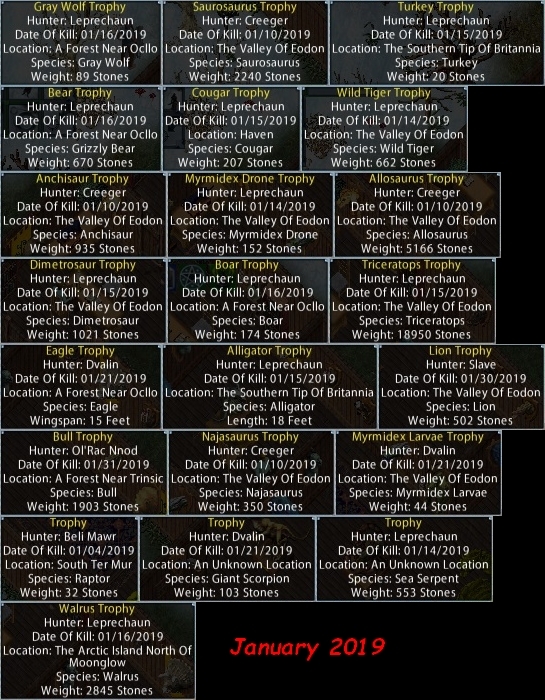 It seems 2018 went quietly into the night, for Huntmasters anyway. 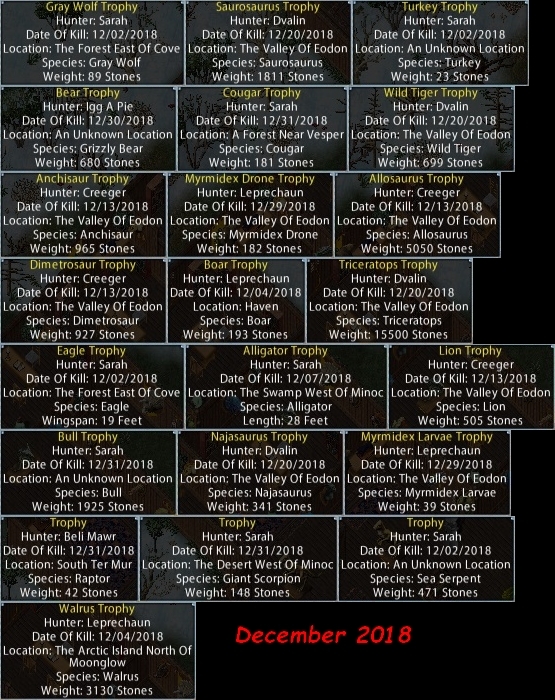 I have no new records to report from December. No new records to report for January 2019. We had a couple close calls, this month, but no new records. Leprechaun tied Causticâ€™s record Bear at 790 stones. Itâ€™s speculated that 790 is the maximum weight for a bear, as there are at least 3 kills on record at that weight. Also, Sarah tied Rayâ€™s Lion record at 580 stones.